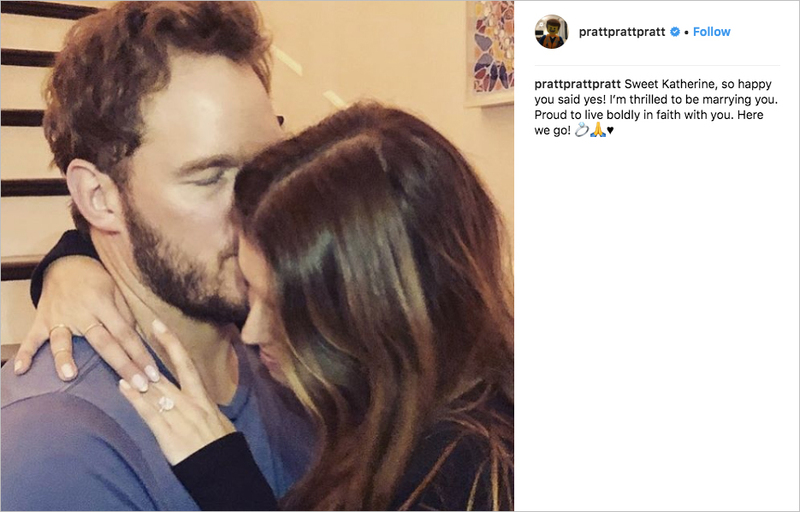 Home > Celebrity Style > Chris Pratt & Katherine Schwarzenegger Are Engaged! See the sweet message from Anna Faris. Chris Pratt and Katherine Schwarzenegger are engaged! The superstar shared the news on his Instagram account, which led to many congratulations from other celebrities. Among the well-wishers were Chris’s costar on Parks and Recreation, Rob Lowe; his fellow Marvel superhero Tom Holland, who plays Spider-Man; Katherine’s brother, actor Patrick Schwarzenegger; and her mother, Maria Shriver. Perhaps most notably is that Chris’ ex-wife Anna Faris commented, writing: “I’m so happy for you both!! Congratulations!” To many this shows how committed the two are to maintaining an amicable relationship and co-parenting their six-year-old son Jack. It was the mother of the bride-to-be who actually set the couple up, due to their shared religious faith. The pair have been fairly private about their relationship on social media, but word got out when they were spotted attending church services together. As a result, we expect they will have a traditional ceremony. Unless they choose to have a very small guest list, it is sure to be a star-studded affair, given the groom’s profession and the bride’s family. Not only is she connected to Hollywood, but there could be political figures as well. Her father Arnold Schwarzenegger is both a former action hero and California’s former governor, and through her mother she is related to the Kennedys. The couple has been dating for under a year; will their engagement be the same length? We’ll have to wait and see. If the wedding is anything like Katherine’s gorgeous engagement ring, it’s sure to be a beautiful event. See Tim Tebow's recent engagement to former Miss Universe Demi-Leigh Nel-Peters, and discover other celebrity weddings we're expecting this year.